BMW Motorrad presents two world premieres at the international motorcycle show EICMA from November 5th - 9th in Hall 14 of the Milan trade fair centre. S 1000 RR. Furthermore another two motorcycles will see their world premiere at EICMA. In addition to these new models, BMW Motorrad will be exhibiting the complete range of vehicles and motorcycle clothing for the upcoming season on a surface area of more than 1,600 square metres. The Ottawa Motorcycle Show is coming back this year and there's going to be even more to see! - 3-Day Show once again! - Special Events for Friday the 13th & Valentine's Day! - Show Program is a full gloss magazine this year! We've already laid out the floor plan, and those who commit to the show first will be entitled to the best choice of space. On October 19th in Erin Ontario, the final round of the Ontario Enduro Championship took place under sunny skies and perfect track conditions. Situated on a picture perfect 100 acre property, this final race of the season featured three spectacular special tests that all racers loved. Our host Ric Wilson spared no expense grooming the Motocross track and creating two further tests in the forest that were carved out to perfection. There were large elevation changes and a great mixture of obstacles. The smallest and most novice five year old racers were entertained and challenged as well as the most experienced Super Youth competitors on full size bikes. The race was made up of four laps of this course making for twelve special tests on the day timed to the second. Rider times were gathered electronically by transponder with results posted minutes after the last rider crossed the line. A huge buffet lunch was provided to all racers and spectators immediately after the competition. Once everyone enjoyed lunch it was back to the motocross track for some recreational riding as the awards ceremony was prepared. Many prizes courtesy of Royal Distributing and Parts Canada were given out during the award ceremony for the day’s competition. Immediately following the race day awards was the overall series championship number one plate presentation. World Enduro Canada would like to thank all the racers participating in the series in 2014. It has been a fantastic year with ever increasing ridership. We have been fortunate to visit some great properties this year and have the support of some great host family land owners. This series is also greatly assisted by our corporate sponsors; Wiesner Insurance, Royal Distributing, Parts Canada, Honda Canada,Yamaha Canada, KTM and Husqvarna Canada. There is some great talent within the racers of this series and it’s good to know off-road motorcycle racing has a bright future in Ontario as a result. Directly from the folks at Ducati, it's their DVT (variable valve timing) technology explained. Ducati presents the first motorcycle engine with variable timing of both the intake and exhaust camshafts. Named Ducati Testastretta DVT, Desmodromic Variable Timing, Ducati's new Desmodromic engine is the first in the world with variable timing on both inlet and exhaust camshafts, leading the way for a whole new generation of such engines. The innovative, new design overcomes an engineering gap in current production motorcycle engines and underlines Ducati's strength in developing ground breaking engine and motorcycle technologies. The variable timing system is able to continuously adjust valve timing, by acting independently on both the intake and exhaust camshafts. The system optimises engine performance throughout the rev range and in any operating condition, to guarantee the highest power, smooth delivery, muscular torque at low rpm and reduced fuel consumption. With full Euro 4 compliance, DVT sets a new standard in the combination of power, delivery and usability of motorcycle engines. MIR comes in a brilliant orbital white with fine metal flake and finished with blue pearl clear. The result is a glowing white Ural with hues of blue that shift with the light - a perfect paint job for your intergalactic mission. ...and a custom tonneau cover that uses reflective insulation and can be used as a rescue thermal blanket. 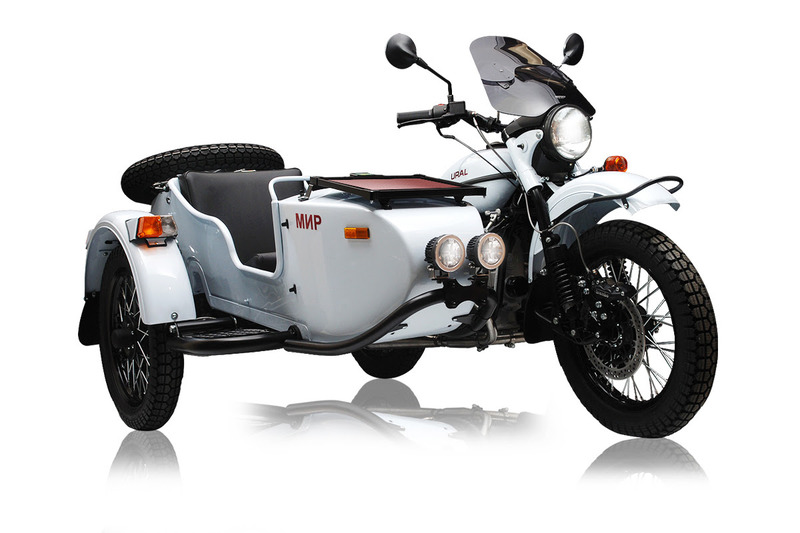 2014 LE Ural "МИР" - the only motorcycle that comes with the solar panel, the wrench and the Lev Andropov’s problem solving method. 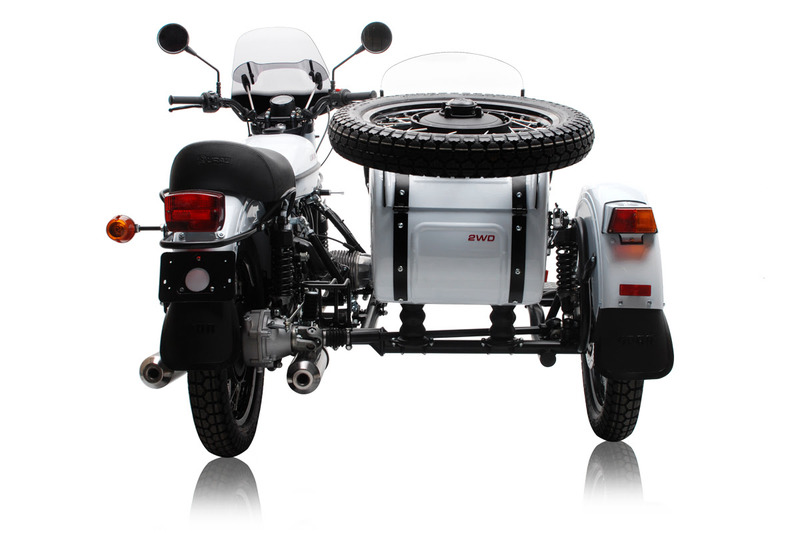 Special Features: Rider and passenger windshields, dual accessory front mounted LED fog lights, spare tire, solar panel, sidecar nose luggage rack, custom tonneau cover with thermal lining, accessory wrench, “MИР” LE badging, on demand 2WD. Reserve your MIR on our website or call your local dealer. BMW Motorrad achieves new all-time high in the third quarter of 2014. 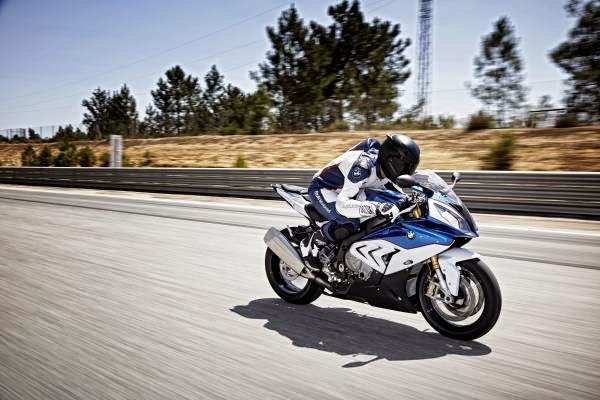 BMW Motorrad once again achieved outstanding retail results in September 2014, supplying a total of 9,991 vehicles. As compared to the already strong equivalent month in the previous year ( 9,264 units), 7.8 % more motorcycles and maxi scooters were supplied to customers. As of September, worldwide sales likewise reached a new all-time high of 100,217 units sold, an increase of 7.6 % (previous year: 93,154 units). Heiner Faust, BMW Motorrad Head of Sales and Marketing: "For the first time in the history of BMW Motorrad we have supplied more than 100,000 vehicles to our customers in the first nine months of a year. This is an increase in sales of 7.6% as compared to the equivalent period last year." BMW Motorrad recorded retail growth in almost all sales regions during the first nine months of the year. Germany remains the most important single market: here BMW Motorrad is once again the market leader, with 17,068 vehicles sold and a market share of just under 25%. It is followed by the USA, Italy, France and the UK in the ranking list of sales figures. BMW Motorrad intends to remain on course for growth in the upcoming season with new models. A few days ago three new and innovative vehicles have been presented at the motorcycle trade fair INTERMOT in Cologne - the R 1200 R, the R 1200 RS and the S 1000 RR. The two water-cooled boxer models and the new supersports bike were a success with motorshow visitors, of whom there were more than 200,000. Two more new models will be presented at the international EICMA motorshow in Milan at the beginning of November. Just a few days ago BMW Motorrad won four awards from UK's most respected motorcycle publication, MCN. 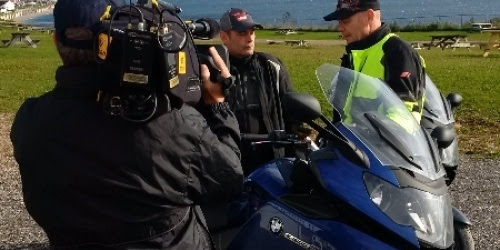 Heiner Faust: "We are very pleased to have been named Best Manufacturer of the Year as well as winning first place with the BMW R 1200 GS Adventure, the R 1200 RT and the R nineT." Yamaha Motor Canada is thrilled to introduce the all-new Yamaha R3, Bolt Café, YZ250FX, WR250F and SMAX! Highlighting the group is the all-new Yamaha R3. Sporting a new, twin cylinder 320cc engine and all-new chassis, the R3 offers class-leading power combined with light, agile handling. 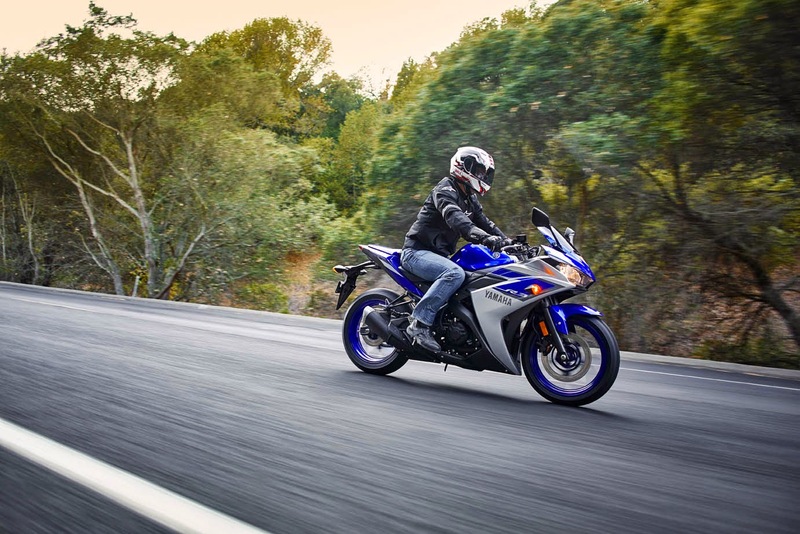 The Yamaha R3 will be available for $4,999 in Yamaha Blue, Vivid Red and Metallic Black. There’s a new member of the Bolt family. Available in Dark Grayish Metallic Green and Silver, the 2015 Bolt C-Spec has all the great engine characteristics of the Bolt, plus low slung clip-on handlebars, new solo seat with rear seat cowl and a more sporty riding position. Canadian MSRP for the Bolt C-Spec $9,699. For the off-road enthusiasts, there are the all-new YZ250FX and WR250F, both available in Yamaha Blue. The YZ250FX is the perfect cross country or hare scramble machine. 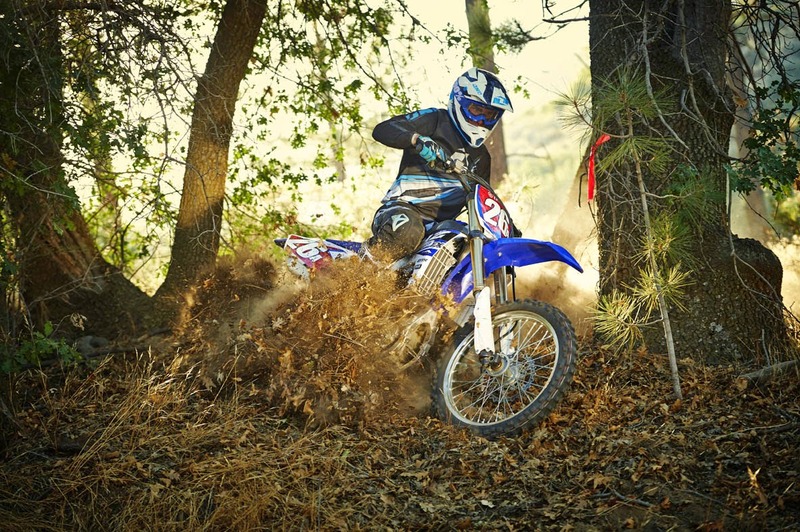 With the performance potential of the YZ250F, but with electric start and an 18-inch rear wheel, the YZ250FX is the bike for those serious about winning or for the weekend warrior who wants maximum performance in a convenient package for woods or track. For the WR250F, Yamaha has taken all the revolutionary YZ four-stroke technology such as; rearward slanted engine, reversed cylinder and a compact chassis and delivered it in an enduro package for light, agile handling on tight trails. The all-new YZ250FX will be priced at $8,749 while the WR250F will be $8,799. Finally, for the crowd looking for fun, affordable transportation there is the fully automatic SMAX. Powered by a 155cc single cylinder, 4-valve, fuel-injected engine, the SMAX can easily keep up with traffic. 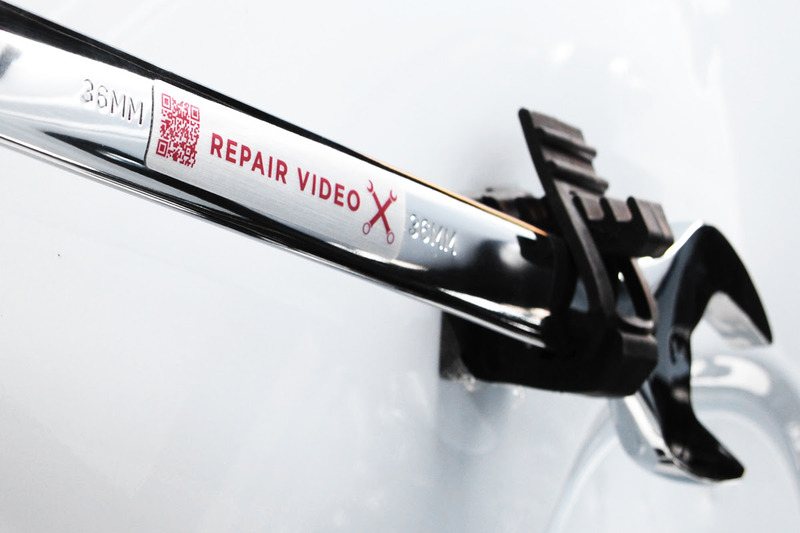 With loads of wind and weather protection, it’s virtually vibration free. 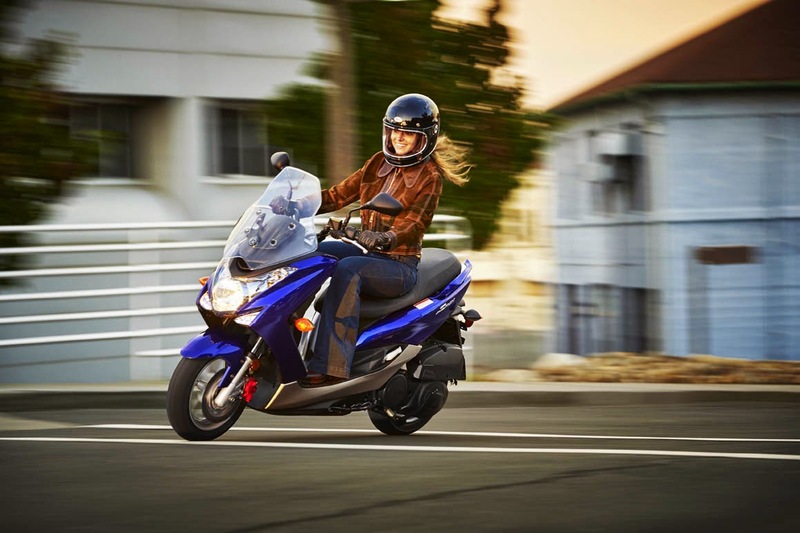 Priced at $3,999 in either Matte Titan or Dark Purplish Metallic Blue, the SMAX is the perfect commuter scooter. 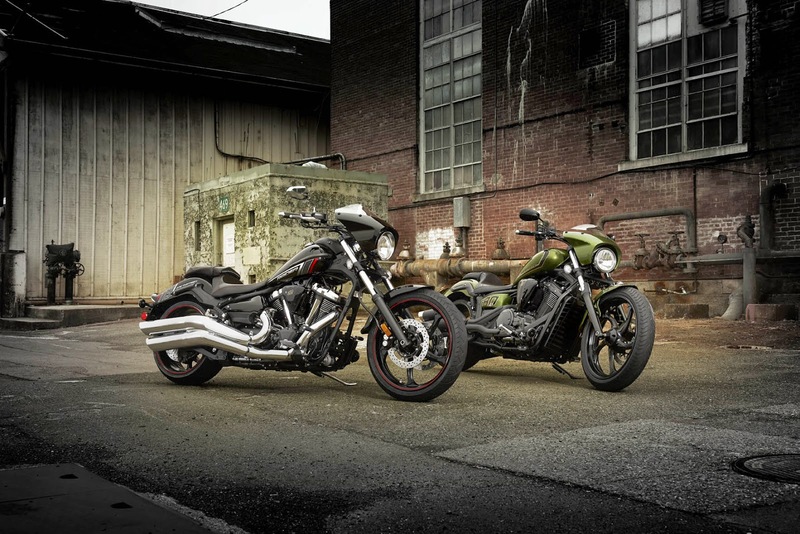 Also released are the new-look Yamaha V-Star 1300 Deluxe SE, Stryker SE and Raider SE. Both Stryker SE ($12,599 MSRP) and Raider SE ($16,499 MSRP) models have all the same great features of the original units, but with the addition of a cool, small bikini fairing. Not only does it look great, it also helps reduce wind fatigue. Available at $14,999 MSRP, the V-Star 1300 Deluxe SE is sure to turn heads with its aggressive blacked out power plant and contrasting vivid red paint scheme. The final round of the Ontario Enduro Championship will be held October 19 near Erin Ontario. The competition is tight in all classes but at the end of the day Sunday, Champions will be declared and number one plates will be presented. The course at this venue is breathtaking. Tremendous work has gone into preparing this event that will include excellent spectator access. This venue boasts a large building that will allow for lunch and the awards presentation in the event of inclement weather. This is a must see event that features the best up and coming riders in the province. In the past, Enduro competition has been a sport that specifically excluded young riders. World Enduro Canada addressed this concern head on and now we see more and more new riders enter the sport and their ability improving at each event. With this series now well entrenched, the future of off-road motorcycling in Ontario is bright. Come out and see why this is the most talked about off-road race series around. Check out www.worldendurocanada.com for directions and more event details. Mark your calendars! On Any Sunday - The Next Chapter is hitting theatres November 7th. I may or may not have watched this trailer abot a hundred times. There's no Canadian venues listed in the Find a Theatre secton of the site but we're hopeful! 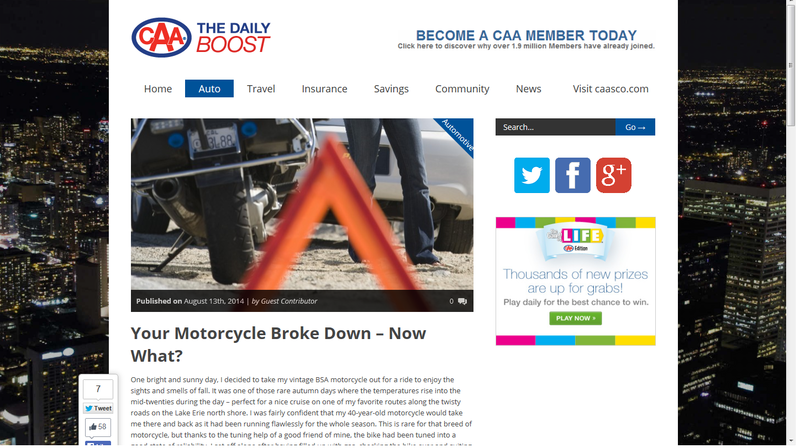 Some tips fronm CAA regarding mororcycle breakdowns. Pretty common sense stuff but it's always nice to be reminded. 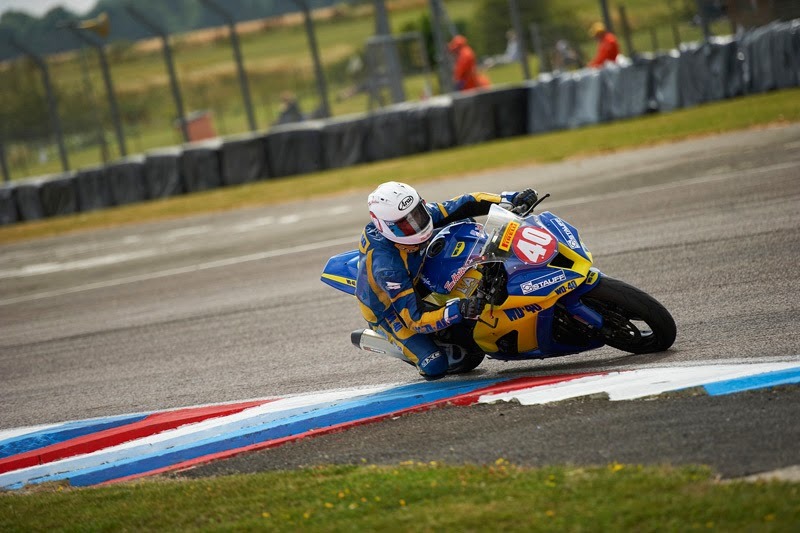 As Muscular Dystrophy Awareness Month concludes Canadian resident Ben Young, who competes in the British Superbike Championship (BSB) with Team WD40, is proud to announce his participation in the Laps 4 MD fundraising initiative in support of Muscular Dystrophy Canada. Celebrating 60 years of progress Muscular Dystrophy Canada supports people affected by muscular dystrophy and related muscle diseases. Together, these rare conditions are referred to as “neuromuscular disorders.” Neuromuscular disorders are a group of diseases that weaken the body’s muscles. In support of the Laps 4 MD “Race for the Cure”, Collingwood-based custom home builder and longtime sponsor Scot-Build Developments Inc. will donate $2 per lap completed in the Top-15 by Young in the remaining two rounds of British Superbike Championship at the Silverstone GP, 03-05 October and Brands Hatch GP, 17-19 October. Young earned his best finish of the season so far with 12thplace finish the last time he raced at Silverstone and followed up this result with a 14th place finish at Donington Park earlier in September. Young will join Laps 4 MD racers NASCAR Canadian Tires Series driver Joey McColm and Canadian Auto Dirt Track Race Shelby Mills who have supported this initiative this season. Young encourages Canadian fans to learn more about Laps 4 MD by following @LAPS4MD on Twitter and on Facebook at facebook.com/Laps4MD . Canadians can also learn more about Muscular Dystrophy Canada's mission is to enhance the lives of those affected with neuromuscular disorders at facebook.com/muscle.ca and on Twitter at @MD_Canada. UK fans can learn more by liking: facebook.com/musculardystrophycampaign and following @TargetMD on Twitter. Bonneville Salt Flats, Utah- Motus Factory Racing set the two fastest land speed records of any American production motorcycle at the AMA-sanctioned 2014 Bonneville Speed Trials. 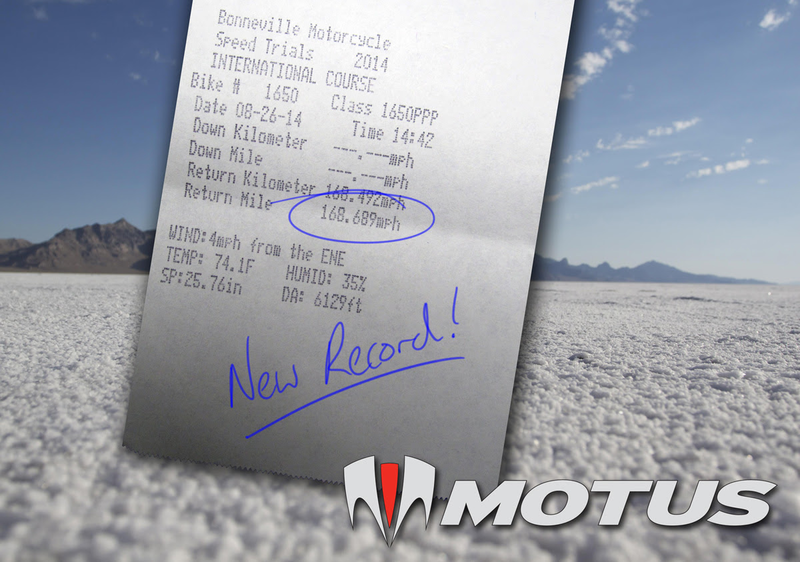 Competing in P-PP and P-PG classes, the new records also establish the stock Motus MSTR as the fastest production pushrod motorcycle in the world. The Motus MSTR motorcycles were raced in stock, unmodified condition with just the mirrors, turn signals and license plates removed. With top speeds of 168.69 mph and records of 163.98 mph and 165.81 mph respectively, company founders Brian Case and Lee Conn set the records before re-attaching the mirrors and license plates and riding 1900 miles back to the Motus factory in Alabama...in 30 hours. Now in its 100th year as a proving grounds for the world's fastest vehicles, the Bonneville Salt Flats' high friction surface and 4200 ft. altitude reduced potential top speeds by 20-30 mph from speeds on pavement at sea level. The records average two consecutive runs ("down" and "return") that must take place the same day. 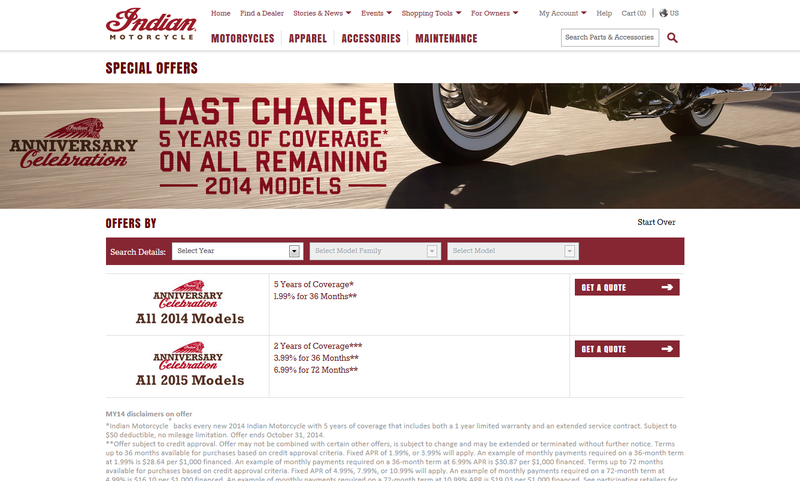 If you've been on the fence about buying an Indian - now is the time. If we're to believe news from VisorDown and Asphalt and Rubber the big adeventure line up at KTM is just about to get even more crowded. The 1190 was just intruduced in Canada and now there's news of the 1290 and now a 1050! It's possibly a Europe only model if the rumor is to be believed. 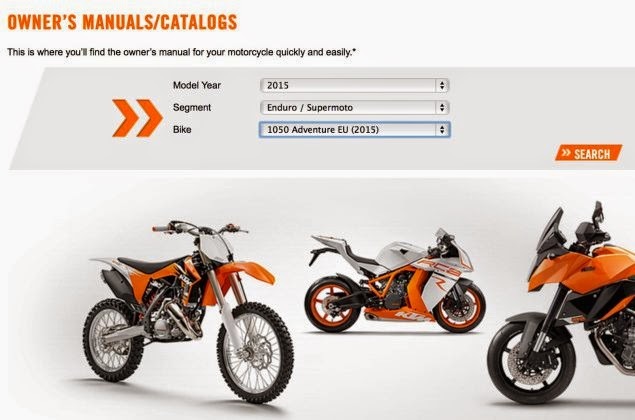 KTM’s Owners Manual website, offered a peak at it with a heading for a “1050 Adventure EU (2015)” Word is that it'd be a rebored version of the KTM's 999cc motor from the discontinued 990 Adventure models. It'd be offered as a more budget machine entry point to get into the big adventure bike market. That's not too bad an idea. Will it get produced and come to Canada... that's the question. Cologne (Germany), 30 September 2014 – At the end of the first day of Intermot 2014 – the International Motorcycle Fair being held in Cologne (Germany) from 30 September to 6 October –Ducati finally unveiled one of the most eagerly awaited new bikes to go on show there; the Ducati Scrambler brand immediately became the focus of media and public attention, and the undisputed star of this key German fair. Re-proposing the yellow containers that characterised the original, highly creative launch phase, Ducati set up a Ducati Scrambler brand-dedicated space in the exhibition area of its Intermot 2014 stand. This symbolic opening-up of a "new world" at the end of the press-dedicated day involved both public and media in an original presentation that was fully in keeping with the language and style of this exciting new concept. The waiting is finally over. The Ducati Scrambler is finally out of the yellow container that has so jealously guarded it over the last few months and is now – after the previews granted to employees and Ducatisti at World Ducati Week 2014 - officially ready. 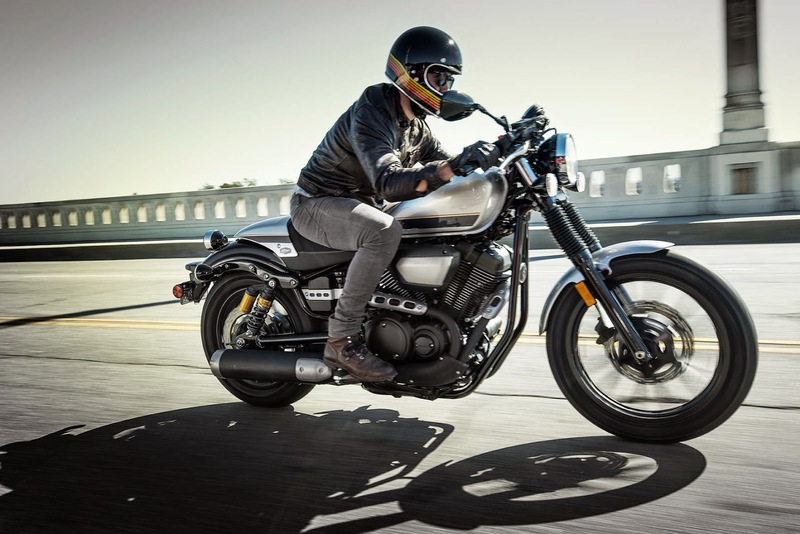 This is more than just a new bike: it’s a whole new world, one that expresses itself via a range of options and versions that provide a starting point for satisfying the different needs and wants of individual motorcyclists. 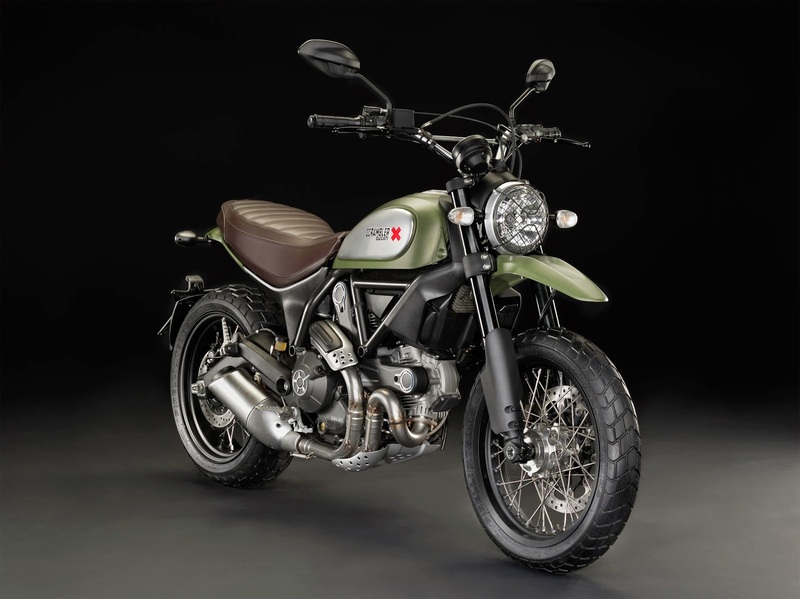 The Ducati Scrambler is a contemporary bike that expresses the pure essence of motorcycling. 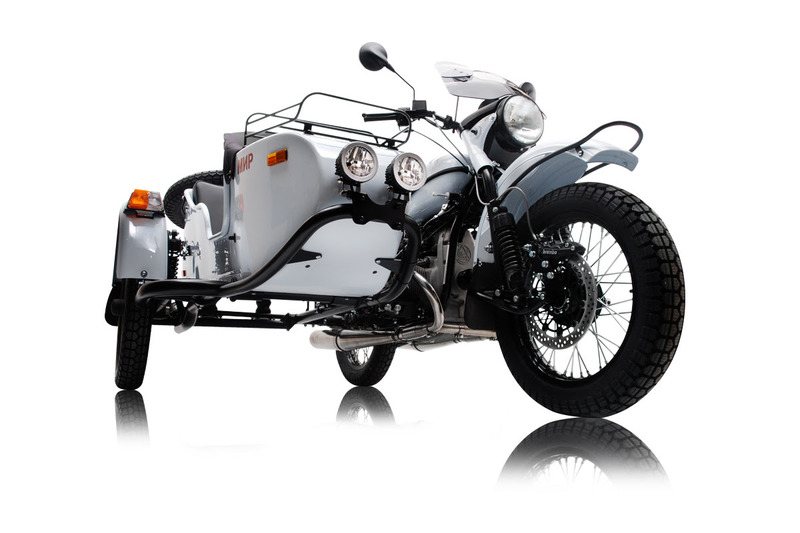 Tried and tested materials such as the aluminium of the rear swingarm and engine covers and the steel of the teardrop tank and frame are combined with new-generation components such as front and rear LED lighting and LCD instruments. Wide handlebars and a long seat provide a comfortable, relaxed riding position and, together with the low weight, low centre of gravity and slightly knobby tires, ensure pure riding fun whatever the situation. “Post-heritage” design gives a contemporary take on the iconic bike built by Ducati back in the 60s and 70s. This Ducati Scrambler, though, is no retro bike: it is, rather, intended to be just how the legendary Bologna-built motorcycle would be today if Ducati had never stopped building it. The Icon version, in yellow and red, is joined by three others - Urban Enduro, Full Throttle and Classic - each offering its own style and performance-related interpretation of the Scrambler spirit. The Urban Enduro, with its “Wild Green” paintjob, is for enduro style enthusiasts and ready to switch from city streets to country backroads in an instant. The Full Throttle is for riders enthralled by the flat-track racing world who have a penchant for pushing things to the limit. And the Classic is for devotees to details and a 1970s look who want the uncompromising riding pleasure and comfort of a modern-day bike. The headlamp, together with the tank, forms a key part of the Ducati Scrambler look. Rounded, classically designed yet extremely modern (i.e. post-heritage) it features a glass parabola and an ultra-modern LED light guide around the rim that acts as a side light. Seat and tank have been carefully designed to give the Ducati Scrambler appealing proportions. A compact bike, the Ducati Scrambler instils confidence from the very moment you set eyes on it. It’s been sized to make it accessible to all motorcyclists while the long seat maximises comfort and can also accommodate a passenger comfortably. An oil and air-cooled L-twin two-valve 803 cc engine powers the Ducati Scrambler; it has an 88 mm bore, a 66 mm stroke and has been redesigned to give smooth acceleration throughout the rev range. Moreover, thanks to a vast range of apparel and bike accessories, to be presented in November, the Ducati Scrambler offers a virtually unlimited range of exclusive personalisation and lifestyle options. The Ducati Scrambler name has much in common with the verb to scramble - mixing up, blending, letting the imagination run free, sharing with others. The Ducati Scrambler is the two-wheeled alter ego of those who ride it, a cultural movement in and of itself. It’s free-spirited, positive and anti-conformist, open to encounters with other philosophies and styles. Ducati Scrambler isn’t just a bike, it’s a world. 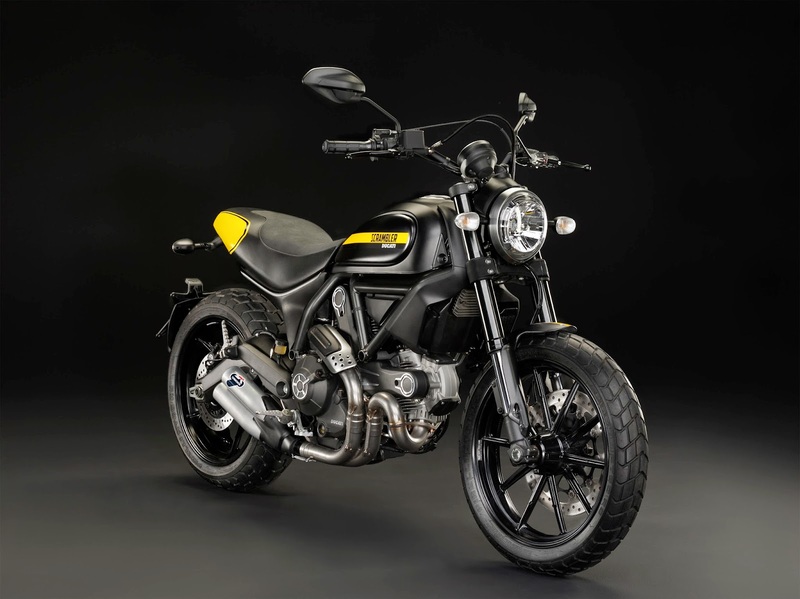 The Ducati Scrambler will be in Ducati Dealerships starting form the end of January 2015 and the first of the four versions to become available will be the Icon. For further information on the Ducati Scrambler world go to www.scramblerducati.com or the Scrambler Facebook page www.facebook.com/scramblerducati and share the content through #scramblerducati or #scrambleryouare.